House of Fine Wines: Market Fun! It's the last weekend before Chinese New Year so get your wines sorted now! If you're at all familiar with HOFWs, you'll know we never miss the markets. Join us at not one, but two on Sunday. Sean will be up in Discovery Bay with the usual suspects; Superiore foie gras, Valnerina truffles, terrines, and various other goodies that are perfert for some decadent appetizers. He will also have a variety of wines from France, Italy, Spain, and Australia, so please come by for a taste or two! 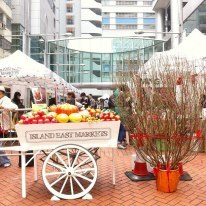 The market is hosted by Handmade Hong Kong. I will be joined by young Lionel for the Island East Market. There will be an assortment of Chinese New Year activities, so come by for some culture and entertainment. And don't forget, we can offer free next day delivery until February 9th!